Gorgeous packaging from Guerlain, as usual. I picked up the Sahara Jewel after some deliberation, and what got me was the fact that when I go for a bronzed look, I always pick a coral or peach-toned blusher to match it. Somehow, I feel like pink doesn’t work quite as well, relatively speaking. However in this case, I was intrigued and wanted to see what shade of pink Guerlain paired up with their famous 03 bronzer shade. Maybe, just maybe, I’d be proven wrong and expand my options. I haven’t used the Sahara Jewel on my cheeks yet (soon though…), but based on swatches alone, I am very excited and hopeful. This pink has a lovely warmth to it – definitely part of the same ‘family’ as the bronzer. I’ll let you judge that yourself based on the upcoming swatches. 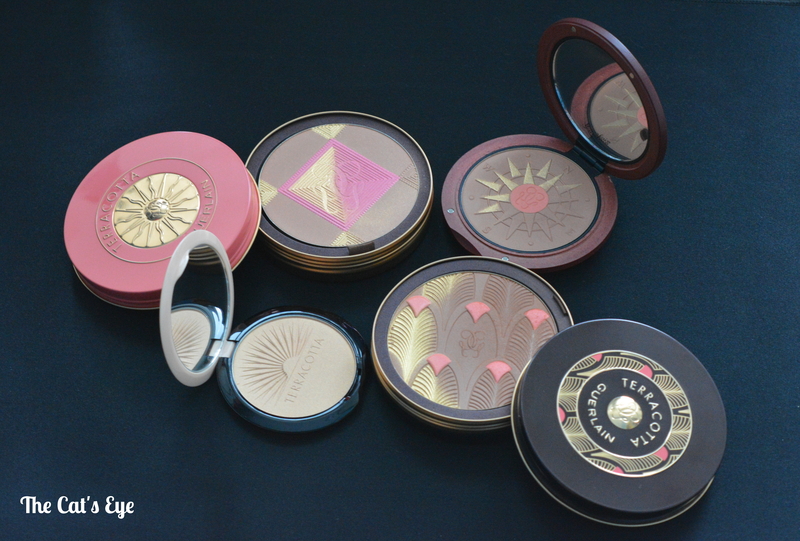 By the way, Guerlain’s bronzers tend to be pigmented, but they are pressed quite hard. So you’re in no danger of ending up with brown cheeks after one brush swipe – you can easily build up the intensity to the level you want. But… the texture is different between the blusher in the central ‘diamond’ area, compared to the rest of the bronzer: the pink blush is pressed far less hard, so be careful to not dig your brush into it too much from the start. As for the Terracotta Summer Glow, this is pretty much sunshine in a box, which gives off a luxurious yellow-gold glow. ❤ It’s meant to be a highlighter (but definitely not a blingy one). But you don’t have to use it as such. It envelops your skin in a golden, radiant veil, so it can work as an inner corner highlight, or as a blush / bronzer-topper. You can basically customise any other face colour with this dusted on top, and it will either switch things from matte to radiant, or from cool-toned, to warm (or both). Pretty nifty, huh? I’d definitely recommend this for that reason. Plus, layering powder pigments is a lot of fun. Finally, here are some swatches for all the products mentioned above: side by side, you’ll see the Chic Tropic and the Route des Îles bronzers, which are almost indistinguishable on the skin. Although perhaps the new Route des Îles is slightly more matte. Next to these you can have a look at the Summer Glow & the Sahara Jewel: I think both look stunning, and the pink blusher is expertly suited to the bronzer shade – so, I stand corrected. 🙂 This will definitely be a frequent colour combination for me, and I’m actually delighted to have snatched up the Sahara Jewel. Did you grab any of these products yourself? If so, would love to know your thoughts!